Enjoy an Athens private tour to some of the most important and most famous museums in Greece. The true treasure of the world. The Acropolis,Temple of Zeus, Hadrian’s arch, the Panathenean Stadium (“Kalimarmaro”, site of the first modern Olympic games in 1896), Plaka, Hadrian’s library, Roman agora, the Ancient Agora of Athens, former Royal Palace, Zapion megaron, Constitution Square, House of Parliament, Monument to the Unknown Soldier, catholic cathedral, the Athens academy, Athens university, National library, museum of history, Athens shopping center, Kolonaki (high end of Athens center), Lycabettus hill, the former royal garden, Archaeological Museum of Athens, The new Acropolis Museum, Museum of Cycladic Art, Benakis Museum, Byzantine Museum, Lalaounis Museum of Jewelry. Visits: Archaeological Museum of Athens, The new Acropolis Museum, Museum of Cycladic Art, Benakis Museum, Byzantine Museum, Lalaounis Museum of Jewelry. Our Athens taxi tours driver will drive you around Athens, the historical capital of Greece, containing a variety of museums, ranging from archaeological and historical museums, to centers of modern art, religion and Greek jewelry. Our Athens private sightseeing tour starts from the new Acropolis Museum and the National Archaeological Museum of Athens, the focal point of Greek Museums. The Archaeological Museum of Athens features a large collection of ancient artifacts from all over Greece and it ranks among the best museums in the world. Its impressive collections depict the rich history and culture of the great civilization of Ancient Greece. The new Acropolis Museum is located by the foot of the Acropolis on the pedestrian Areopagitou Street and is housed in the most modern Museum building in the world. The Archaeological Museum is housed in a gorgeous neoclassical building in downtown Athens and features a gift shop and café located at the sculpture garden. Athens tours will introduce to you the excellently curated Museum of Cycladic Art, boasts an exciting collection of artifacts and sculptures from the Cyclades Island Complex (Santorini, Mykonos, Paros etc). The Benakis Museum features a large collection of artifacts representing the various periods and eras of Greek History. The Byzantine Museum, hosting artifacts from the Byzantine Empire and Era, and the Jewish museum featuring artifacts from the Jewish communities in Greece and the Balkans are also included in our Athens private sightseeing tours. Athens Taxi tours would not be complete without a visit to the Lalaounis Museum of Jewelry, that hosts a large collection of antique and modern jewels from Greece and all over the world. In most of the Museums there are gift shop offers, amazing prints and memorabilia. Athens taxi tours Greece ends this most historical & cultural Greece tour by dropping you off at the point you’ve requested in Athens. 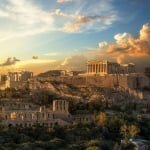 Highly recommended for cruise travelers visiting Athens just for a day to experience one of our Athens tours to enjoy the most cultural and historical of the Greece tours.